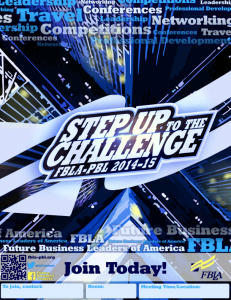 The FBLA-PBL National Center recently announced that FBLA member Samantha Kragel's design was the winner in the 2014–15 Membership Poster Design Contest. Get a jump start on recruiting new members for the fall and download the poster from the "Documents" section under "Chapter Tools." Formally printed posters will be available in the fall. Congratulations Samantha on a fantastic design!